Landscaping may seem like a chore to you, but the outdoors is a playground for kids. Take advantage of the natural attraction between dirt and children and let them help the next time you’re working outside. Getting involved with landscaping projects is a great way for them to burn off energy, learn about the natural world, and develop a sense of competency and responsibility. Kids can help with all sorts of work, from routine maintenance to building new projects. Create bird habitat. Have them help you install a bird bath and bird feeder. If you’re ambitious, you can even have them help build a birdhouse or help paint one that you buy at a craft store. Keep it fun by having them keep a running list of the birds they see coming to snack in your yard. Plant a garden. Kids love putting seeds in the dirt and watching the miracle of green sprouting a couple of weeks later. They’re also more likely to be excited about eating their vegetables if they’ve helped grow them. Bring in the butterflies. 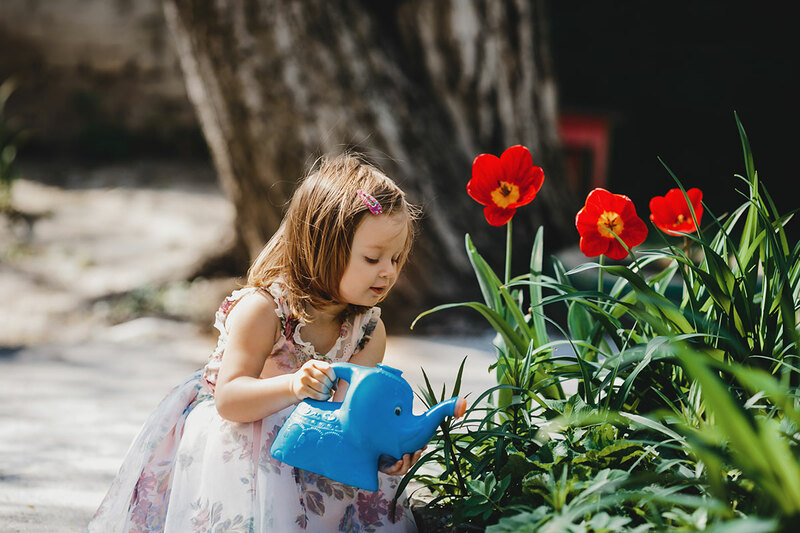 Have your kids help you choose and plant blooms that will attract butterflies to your yard or garden. Good choices are cosmos, marigold, red bird of paradise, Baja fairy duster, and desert milkweed. Monarch caterpillars require milkweed, so planting it may bring these iconic beauties to your yard. If you’re lucky, your kids can watch the lifecycle from egg to caterpillar to chrysalis to butterfly. Build a fire pit. Kids can help lay paving stones for a fire pit. You’ll need enough stones to make the pit about 3 feet in diameter and at least 15 inches tall. Make sure you arrange seating a safe distance from the flames and cover the opening of the pit with a screen for safety. After their hard work, your kids will enjoy their s’mores even more. Build or buy a picnic table. Let the kids make it their own by picking out a combination of bright colors to paint it. Create a stepping stone path. Have the kids paint the stones in colors of their choice and arrange the path in hopscotch patterns. Recruit them for weeding. Kids love digging in dirt. Give them a trowel or let them use their hands to pull or dig weeds from the garden or from rock landscaping. When the leaves fall, hand them a rake. As a reward, they get to jump in the leaf pile at the end. Let them get wet. Kids like working with water, whether it’s carrying little pails of it to thirsty plants or spraying a hose at the trees. Plan on having towels ready when they return to the house. Have them care for the birds. Most children love animals and enjoy feeling like they’re helping care for them. Teach them how to keep the bird feeder clean and keep the birds fed.